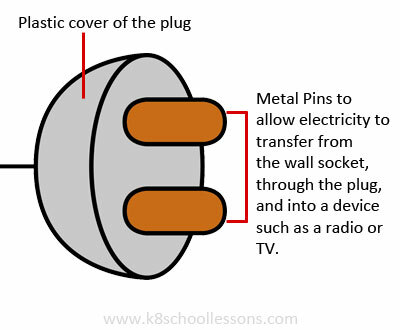 This lesson is about conductors and insulators for kids. Learn about lists of heat conductors, lists of heat insulators, lists of electrical conductors and lists of electrical insulators. We can define conductors and insulators in relation to heat and electricity. 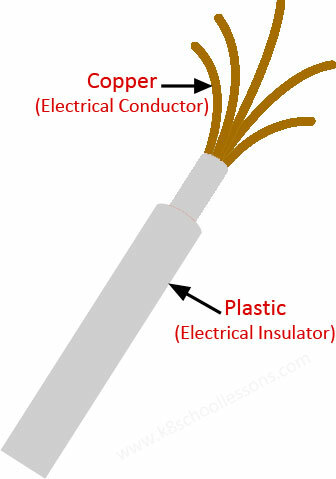 Conductors can be heat conductors and electrical conductors. Insulators can be heat insulators and electrical insulators. Heat conductors or conductors of heat let heat flow through them easily. Have you ever tried to stir boiling soup using a metal spoon? If you have tried so, you know how quickly heat energy flows from the hot soup, through the spoon, to your hand. Do you remember; how your fingers began to get hot??? This is because heat travels faster through metal. Substances like metal are called conductors. The movement of heat through a solid heat conductor is called heat conduction. The metal spoon conducts heat from the hot soup to your hand. Metal is a good heat conductor because it lets heat flow through it easily. Copper and silver are the best heat conductors. Copper conducts heat ten times better than iron. When heat travels by conduction through a heat conductor, the heat is passed on from one atom to the next. The heat flows, the heated atoms don’t! Heat insulators or insulators of heat don’t let heat flow through them. If you have used a wooden spoon or a spoon with a plastic handle, you know how easier it is to stir the hot soup, by experience. This is because neither wood nor plastic conducts heat. Substances like these are called insulators. 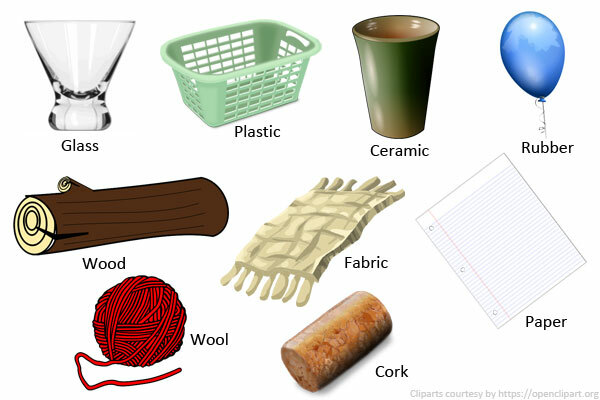 Wood, plastic and air are some of the examples of heat insulators. Gases are poorest heat conductors. In other words, they are the best heat insulators. Air is a mixture of gases. This is why air is a good insulator. Now you can understand that heat conductors and insulators can both be useful, but for different jobs. For example; the bottom of a saucepan may be made from a metal, like iron or aluminium, which lets heat flow quickly from the cooker to the food inside. But its handle is likely to be wooden or plastic. These materials won’t let heat flow to your fingers and burn them. Heat conductors and heat insulators are also called thermal conductors and thermal insulators. Electrical conductors or conductors of electricity let heat flow through them easily. Electrical conductors block the flow of electricity. Copper is a metal that conducts electricity well. Most electrical wires are made of copper. All metals conduct electricity, but some metals are better than others. Copper, aluminium, gold and silver are very good conductors. Silver conducts electricity better than copper does, but silver is too expensive to use for electrical wiring. Electrical insulators or insulators of electricity don’t let electricity flow through them. You know that most electrical wires are made of copper. But if you touch these wires you can get a shock, which is extremely dangerous. That is why all electrical wires are insulated with a plastic cover. Plastic is an electrical insulator. It does not conduct electricity at all. So you can touch the electric wire without getting a shock because of the plastic cover. Plastic, rubber, wood and glass are all good insulators. Electrical wires are covered in plastic and plugs and sockets are made of plastic for the same reason. The plastic insulates your fingers from the electricity flowing through the inside of the plug.